Barnes and Noble Art Exhibit A HIT! Come celebrate Youth Art Month in March. 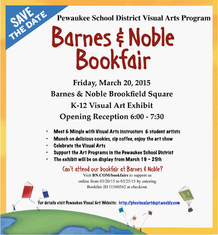 We will host our District-wide visual art exhibit at Brookfield Square Barnes and Noble. The exhibit opens on Wednesday, March 18th in the evening. There will be a public open reception on Friday, March 20th from 6-7:30 and the exhibit will close on Wednesday, March 25th after 3:00. This exhibit is also a fundraiser for the Visual Art departments as Barnes and Noble will donate 5% of their in store and online sales from March 20-25th back to the Pewaukee art programs. You must present the flier and voucher for the purchases to count towards us. Please see the flier attached. here. 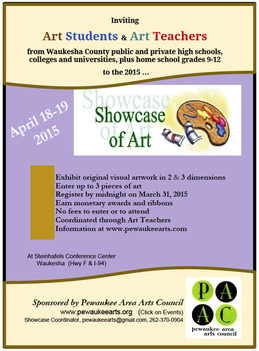 Pewaukee students will also be participating in The Showcase of Art hosted by the Pewaukee Area Arts Council at the Pewaukee Steinhafel’s store on Saturday and Sunday, April 18-19th. Watch for more details on this exhibit on our website or the PAAC website. Mr. Lamp's Art History class and Mrs. Bjork's AP Art class combined for a fantastic, full day field trip to Chicago. Students visited the School of the Art Institute, touring the facility and learning more about the mission of the school. Students also visited the Art Institute Museum viewing the ancient collection and also favorites such as Monet, Van Gogh, Chagall and Seurat. We also saw a really moving exhibit at the Museum of Contemporary Art, featuring the work of Doris Salcedo, internationally renowned Sculpture artist. 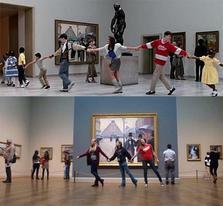 We even had our Ferris Bueller moment too!!! It was a fun day that was inspiring and art-fully great. 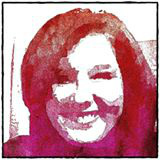 We recently learned that Kellymarie Stamper, alumna of the the Pewaukee High School Visual Art program and a scholarship recipient at the Milwaukee Institute of Art and Design (MIAD) has successfully participated in MIAD's "Major Deal" Exhibition. Kellymarie was awarded first place for her art work in the Sophomore/Junior student show! Congratulations to Kellymarie. I wanted to share some fantastic news with you. We just received word that 9 PHS art students have had their work honored in the Scholastic Art Competition. Scholastic Art is a National Art and Writing competition held annually. Students enter first at the state level and then, if chosen continue onto the National competition. This year we had 10 works chosen, which is the most we've ever had at Pewaukee. Works that receive a Silver or Gold Key are displayed at the Milwaukee Art Museum during the run of the exhibit. Animation and Video are shown on the big screen in the MAM theatre on the day of the opening. Students are invited to the opening at the Milwaukee Art Museum along with their parents and teacher. Students who receive honorable mention receive a certificate and are honored the day of the opening as well, but their work is not displayed due to limited space. In addition to the Art Works honored we also had a student writer received 2 silver keys. For more information on this honor and the exhibit click here: Scholastic and the Milwaukee Art Museum.